The quote in the picture is what caught my attention when it comes to my current situation. Whitehead’s quote brings motivation to life on many levels. 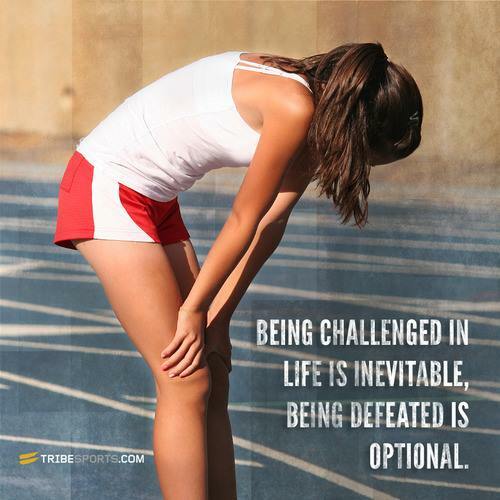 During my workouts this week I accepted two realities that are challenges, but not defeats. I am no longer able to ride the stationary bike or swim until my health situation is resolved. I haven’t been able to ride on the roads for a few weeks, so giving up the stationary bike was not hard to accept. Not being able to swim – that is a bitter pill to swallow. Swimming has been my most challenging sport and I have come to love being in the water. I have spent so much time in the pool working on stroke, efficiency, and endurance that I feel invigorated just jumping in. It is not a defeat at all though. It is a temporary reality I have to accept if I want to come back stronger. I certainly am learning a lot about myself through this – while my physical strength is affected my will and resolve have grown stronger. “What am I supposed to learn from this challenge?” has become a daily thought and I learn something new every day. Challenges and limitations as much as successes and strengths all bring opportunity. Whitehead nailed it by saying “what defines you is what you do with that opportunity.” Accepting defeat is definitely one thing that will not define me. Even if I am not able to experience the opportunity from the water. For now. I felt defeated this morning when I saw the temps and humidity. I couldn’t get myself to go run. I refused to let the weather beat me–entirely. Packed my running gear in my bag and plan to run at the gym. There are only two more days of this nasty weather before cooler temps prevail. Thank you! A treadmill can be a friend when the weather isn’t so friendly! Dammit, my heart is breaking for you. I love the graphic you used!